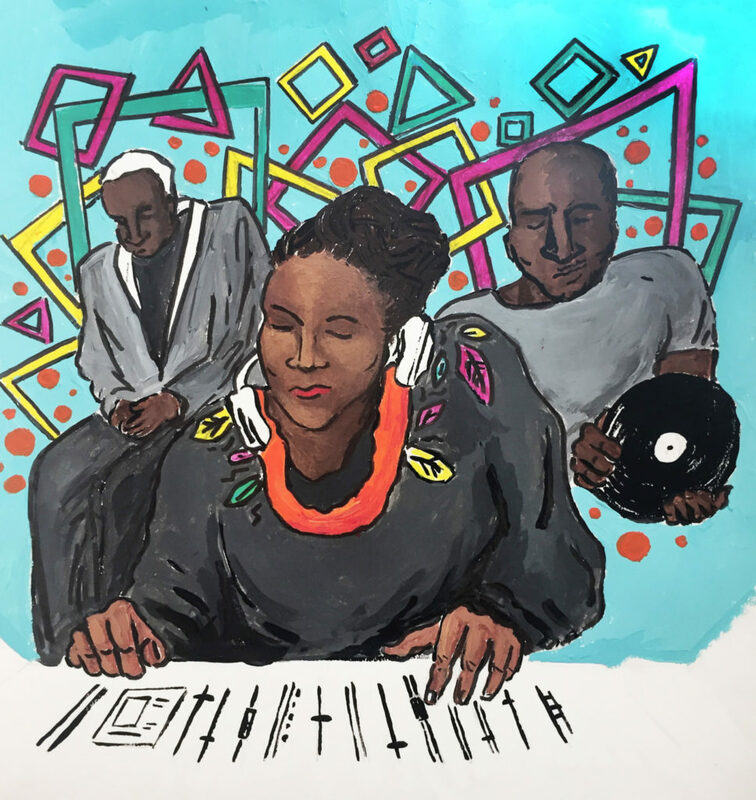 For over thirty years, the style of music known as house has been thumping four-on-the-floor rhythms throughout its native Chicago. Though it has become a worldwide sound, changing with each new piece of equipment and every scene that adopts its trademarks, Chicago always seems to know how to honor house’s rich legacy—and remains ahead of the curve. But it’s no small undertaking for a city to sponsor an outdoor music festival, especially when taking an underground tradition as its focus. So it’s a welcome surprise that the city of Chicago has thrown more and more of its weight behind house music, first with 2015, 2016, and 2017’s Chicago House Parties, and now with the free event’s upgrade to “festival” status. The 2018 festival, which took place on May 26 with panels and workshops on the preceding days, drew a wonderful cross-section of Chicago. Attendees came from the South, North, and West Sides, from around the country, and even from the gay kink-oriented International Mr. Leather event happening at the Congress Plaza Hotel across the street. This was only fitting: the bars and clubs where house first took off were spaces for the marginalized at a time when few existed, largely frequented by LGBTQ, Black, and brown Chicagoans. From Pulse memorials to Paris is Burning, it can sometimes seem that these communities are spotlighted in times of mourning and not in celebration. But the community that arose when people from all over Chicago gathered in Millennium Park approached the utopian idealism of house music’s magnanimous, hopeful voice-overs. The reality was even sweeter: here was a euphoria you could almost hear after walking past the bag check into the park. The 2018 House Music Festival began with a series of workshops and lectures at the Chicago Cultural Center, grouped under the banner of the “Chicago House Music Conference and Dance Summit.” Panels on everything from “What It Means to Be a Working DJ in Chicago” and “House Music Licensing and Distribution” to a workshop on popular digital audio production software Ableton filled the schedule on Thursday, May 24. These were fascinating looks at the elbow grease that goes into being a DJ. Of these, the most enlightening was a workshop on the popular digital audio production software Ableton, where local multi-instrumentalist Antonio Sage walked guests through a new project from the ground up. Music production can be incredibly intimidating for the uninitiated, so having an experienced professional outline the process and provide guidance on what features to focus on or ignore removed the mystery, and made a style of music focused on community that much more accessible. The panels on Friday, however, focused on the various forms of dance that rose up alongside house. Each panel was both a workout and a history lesson, offering a preview of the joy of communion that house can provide in its proper setting: live, loud, and in front of a crowd. The main event of the weekend was the festival itself on Saturday, where DJs from Chicago and beyond played three stages across Millennium Park and the Pritzker Pavilion on a gorgeous summer afternoon. The festival began with every square inch of grass occupied and every shady respite crowded. Highlights included Cordell Johnson and James Vincent, who brought the sound of their popular monthly Excursions party to the Deep House tent. Their two-hour set, which dove into house, its influences, and its offshoots, was a revelation: Vincent and Johnson went onstage in the middle of the afternoon, but their set had the energy of a peak slot at their monthly residency. Immediately afterward, Sabine Blaizin, aka Oyasound, came to the decks. Blaizin spun through sounds that reflected her native Haiti, her current home of New York, and a slyly stunning remix of Childish Gambino’s “This Is America,” which brought a pointed political edge to an otherwise party-starting hour. Though it didn’t rob the room of any energy, it was clear that much of the crowd felt its impact. House may not be an ideology or movement, but it has always been connected to the struggles and politics of the communities that created it. The evening closed with the presentation of the Chicago House Music Award to Jamie Principle, the producer behind club sensation “Your Love” (one of the first House tracks ever) in 1984. After the presentation, Louie Vega and the Elements of Life went onstage to close out the evening. Vega, half of NYC legends Masters at Work, chose to show off his dexterity and knack for reading a crowd with his closing set. Though the Pritzker Pavilion seats are one of the worst places to try and dance in the city, the crowd established solid feedback early on. In time, Vega had subtly (but knowingly) steered the crowd into the kind of energy you can only feel in the hands of a master. Dance music is always changing, whether it’s responding to musical innovation or the opening and closing of neighborhood clubs. House, too, will certainly stick around—though it may seem unrecognizable to us in another five years. The Conference’s classes and events, along with the afternoon festival, became an event that joyfully connected people from across Chicago and the world. Visitors left with a sense for the rich history of four-on-the-floor beats—and respect for all the strange, unimaginable, downright jaw-dropping things a talented DJ can do with them. Peter McCracken is a contributor to the Weekly. He is a music obsessive and newly-minted Chicago resident direct from Milwaukee. He last wrote for the Weekly about a disappointing set by Green Velvet in May.